2. 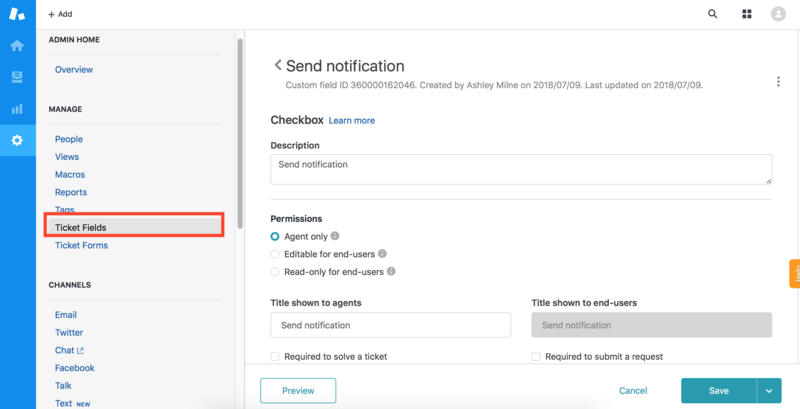 Setup an automation in Zendesk which will send out your desired email notification at your specified time based on this field. Be sure to include in your automation the criteria which will ensure the email is sent only once if so desired. For example, setup the automation to run 1 hour after ticket creation, where field “Send notification” = “TRUE” (this is a checkbox field in our case). The last part of the automation should be an update of the field to = “FALSE”, so that these same tickets are no longer meeting the criteria to be sent the notification in the future. For a detailed guide on setting up & using automations, please refer to Zendesk’s article here. And that’s it! This method ensures that just those tickets denoted in your CSV file will receive the automated email communication.